Glimmer's Galleon is the twelfth level of Donkey Kong Country 2: Diddy's Kong Quest. It is the second area of Krem Quay. This level takes place in the flooded cargo hold of a crashed Kremling galleon. 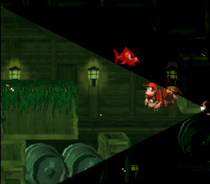 There is hardly any natural light to be found, but fortunately, Glimmer the Angler Fish finds the Kongs soon after they enter the level, illuminating the way for them. Flotsams, Puftups, Shuris, Lockjaws, and a single Klomp populate this level as well. Enguarde is nowhere to be found in this level, so the level's many enemies cannot be defeated by anything but the single Invincibility Barrel hidden exclusively in the Game Boy Advance version of the level. In the Game Boy Advance remake, the level is actually slightly brighter, as it has been lit up more for the standard Game Boy Advance screen, which lacks a backlight. The Kongs swim through the darkness at the start of the level. At the beginning of the level, the primates can find a passage among several large crates and barrels that they must swim through. If they swim north through the passage, they come up to a hidden room that contains an open crate that they can enter to access a Bonus Level. 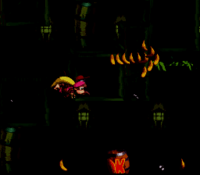 The Kongs can heads through some crates above the entrance to the bonus to reach another room that contains two Banana Bunches and a group of bananas that form the shape of the number three. An additional hidden area is above here on the other side of some crates, and it holds a DK Coin and bananas that form the shape of the number four. The primates can travel no farther in this direction, but if they head south from the passage found at the beginning of the level, they come up to a DK Barrel and a trail of bananas that they can follow to head over a pile of large crates and barrels that support a Klomp. If the primates follow the trail farther into the level, they soon reach a Flotsam and a thin channel that they must swim through. As they approach the Flotsam, Glimmer appears to light up their way. On the other side of the channel, they can find some more Flotsams and a hidden channel that leads into a small room with a Banana Bunch in it. There is an additional passage in this room that the heroes must travel through to progress to a fork-in-the-road. They can either head through an area to the north, or a different area to the south. Both areas meet up at the same point, but they contain different obstacles and objects. In the upper path, the heroes can find a Lockjaw, some bananas in a small alcove, and a large barrel that they can swim through to find a hidden opening among the crates that holds a Banana Coin. The lower path consists of a Lockjaw and some Flotsams, as well as two alcoves full of bananas. At the meeting point of the two separate passages, the primates can find some more Flotsams and a small channel that leads to another pair of passages. The lower passage holds a Flotsam and a DK Barrel, as well as a small crate that the Kongs can swim over to access the upper passage. The upper passage leads to another passage that the heroes must swim through to reach a slightly larger area that contains a Lockjaw and a Banana Bunch. A channel above here leads into another small section with a crate in it that the heroes can swim through reach a hidden passage that consists of two Banana Coins, some bananas, and, in the Game Boy Advance version of the game only, a photograph. The passage also serves as a shortcut through the underwater level, helping them reach a room found shortly after the letter O. If the primates do not take this passage, they instead proceed upwards past an arrow pointing north that is formed by bananas and to a smaller area that holds two Lockjaws and four bananas in an alcove. An area much larger than this is to the north of here, and a few Flotsams thrive in it. The letter O is hidden in an alcove behind a crate in this room, which is followed by a channel that that heroes must swim through to reach a similar room to the west. As they head through the channel, they swim over an arrow directing them to the west that is formed by multiple bananas. Once they reach the room on the other side of this channel, they can find a Puftup in the center of it that, when approached, explodes and shoots spikes across the room. A passage is below this room, and two different areas branch off of it. The first area leads the Kongs through a safe area that is void of obstacles, but the lower area contains a Lockjaw and a Banana Bunch in an alcove, as well as a crate that the duo can swim through to reach a Banana Coin. The two separate areas connect in the location of a single Flotsam with two thin channels above it. The two channels are both thin and straight, and they lead to the same part of the level, which also holds a Flotsam, along with an alcove that consists of some bananas. Another thin passage is to the left of this Flotsam, and on the other side of it, there is a wider area that contains a Star Barrel and a trail of bananas leading downwards. Diddy and Dixie encounter a Lockjaw. If the trail is followed, the two friends head down towards a channel leading to the west, which holds a DK Barrel. An arrow, which is formed by a group of bananas, is placed below this channel, and it must be followed to progress into another room to the west. This room is very large, but it only contains a single Shuri and a Flotsam. The Kongs can find another large room above here that holds a Puftup in the center of it, who explodes and releases spikes when approached. An alcove with a Banana Bunch in it is also in the left end of this area, while a Shuri waits for the primates in the lower right corner of it. 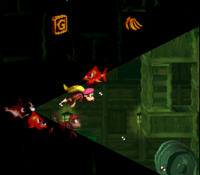 A passage that contains a trail of bananas is directly above the Shuri, and a crate that, exclusively in the Game Boy Advance version of the game, can be swum through to reach an Invincibility Barrel, is to the right of them. 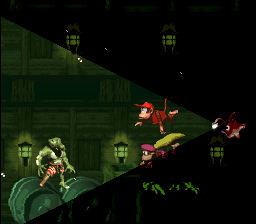 If the primates continue to the wide room above here, they can find a Lockjaw and a few Shuris, one of which that, in the Game Boy Advance version of the game alone, holds a photograph. To the west of here, the Kongs are able to discover an additional room with a Puftup in the center of it that explodes and shoots spikes when approached. After the heroes head through the small passage above this foe, they reach a smaller area that contains a Lockjaw and a pair of alcoves that hold a Banana Bunch and the letter N.
They can find a narrow channel to the north of here that leads to a DK Barrel and past an arrow pointing upwards that is formed by bananas. A few large barrels are ahead of here, and they are positioned under a Lockjaw that patrols that area, which also holds a small alcove with some bananas in it. The primates can find a several Shuris in a wider area to the right of here. As they head through the large area, the Shuris charge at them and a Flotsam swims in their way. The curvy path full of Shuris, which also contains an alcove with the Golden Feather in it, soon leads the heroes to an area with a Puftup that explodes and shoots spikes when approached. This foe blocks a narrow passage, which is located next to another two passages that lead up and down. If the passage leading upwards is taken, the heroes find a Lockjaw and a small area above it that holds a Banana Bunch. There is a wider section to the right of here, which is connected to the previous path that the Puftup blocks. If the Kongs take the lower passage from where this puffer-fish enemy stands, they can find a slightly wider area that contains a Lockjaw and a hidden channel that leads to an open crate, which the heroes can enter to access a Bonus Level. The upper and center passages both connect to a vast room that carries a few Flotsams and a Puftup, who explodes and releases thorns when encountered. A small passage branches off of this room, and a Lockjaw patrols it. The lower passage mentioned previously connects to a smaller room below here, and it also contains a few Flotsams. A passage branches off of both of these rooms, and they both connect in front of another room that contains three Puftups, two of which that explode and project spikes when encountered, and another that simply swells up and rises over an alcove that holds a Banana Coin. In the bottom-right corner of this area, the two friends can find an arrow that is formed by a group of bananas. The arrow directs them upwards through a thin channel, which they must swim through to reach an Auto Fire Barrel that shoots them on the deck of the ship when accessed. An End of Level Target is here, and it is guarded by a Spiny. If they jump on it from the ground, they simply complete the level, but if they jump on it from the nearby large barrel, they not only complete the level, but also win a prize. K: After the primates meet Glimmer, they head into an area that holds a few Flotsams. Northeast from here, they can find a section that contains a single Lockjaw, and in the top-right corner here, they can find the letter K in an alcove. O: Shortly before the Star Barrel, the heroes enter a wide, open area that contains a Puftup in the center of it. In the wide room before this, the Kongs can find the letter O in the top-right corner of the area behind a crate that they are able to swim through. N: After the heroes pass the Star Barrel, they come past several Shuris and enter a wide area that contains a single Puftup in the center of it. If they swim north from here, they can find a small area with a Lockjaw in it. Two alcoves are below this enemy, and the alcove on the left holds the letter N.
G: Almost immediately before the Kongs make their way out of the cargo hold, they enter a large room containing a few Puftups. Shortly before this, they can find a room to the north that contains a pair of Lockjaws. The letter G is in an alcove above these foes. To find the level's DK Coin, the group must swim through the crates above the larger, open crate that leads to the first Bonus Level. Here, they should find some bananas in the shape of the number three. From there, the heroes must feel around the crates above them until they go through another one. It leads them to bananas in the shape of the number four, as well as the DK Coin. To find the Golden Feather, the Kongs must swim past the letter N to access an area where they are surrounded by three Shuries in an open area. From there, they must swim around some crates and travel north, where they should run into to a bunch of crates with the Golden Feather among them in a tight space. Immediately before the letter O, the heroes swim through a small area guarded by two Lockjaws. In an area slightly below this, they should search around and look for a small opening through some crates to the left. After accessing the hidden passage, they must swim through the opening between and over the crates to grab a photograph, which grants them with a picture of Glimmer for the fourteenth page of their scrapbook. Shortly after passing the Star Barrel, the heroes find a trail of bananas leading upwards. At this point, they must head into a hidden passage to the right through a crate to find an Invincibility Barrel that gives them temporary invincibility when hit. With this short-lived ability, they must travel to the right and defeat a Shuri with a photograph over its head. Once the foe is defeated, the Kongs earn a picture of a Shuri for the fourth page of their scrapbook. At the start of the level, the Kongs should swim straight up and head between several barrels. Once they are in a more spacious area, they can discover an open crate jutting from the wall. If they swim into the crate, they appear in the first Bonus Level, where they must travel through a curvy path among many large crates and barrels. If they reach the end of the stage within 40 seconds, they can find a Kremkoin to grab within the remaining time. Near the end of the level, they Kongs can find a Puftup and a group of bananas over some crates that form the shape of an arrow pointing east. Instead of following the arrow, they must head south, where they can find a Lockjaw and a tight passage below it. If the travel through this passage, they can find an open crate. If enter it, they are taken to the Bonus Level, where they need to travel through a maze among many large crates and barrels to find a Kremkoin at the end of it. They have 35 seconds to discover and collect the Kremkoin.